The life of a Voodoo doll is a wild one. It's full of ups and downs. You can use voodoo dolls for both good and evil. People don't always have to be mean. A little voodoo doll can change things for the better. You can dip the voodoo doll into a cozy bubble bath on a chilly night while the real deal heads out into the cold winter air. Maybe the real deal look-alike will be warm even when the cold wind blows. Of course, you could always pin a leg to give them a charley horse if they make you really mad. But that's the last resort, right? You catch more flies with honey than vinegar, after all. 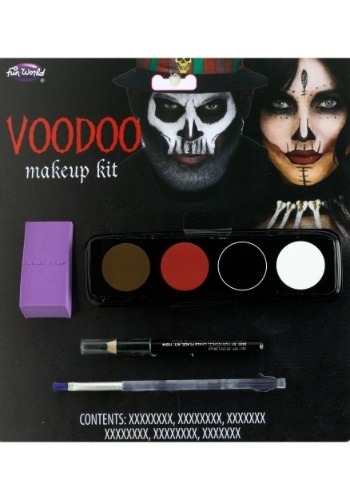 You'll be able to choose from a variety of looks with this strange makeup kit. You'll get four colors of creme paint, applicators, and a pencil to make detail work a breeze. Not sure your skills are up to scratch? No worries, this kit comes with instructions to create a few scary faces. Creating a Voodoo look is a whole lot of fun. Choose from our wide variety of props, wigs, and costumes to make a witchy look of your own. Nothing like spooky details to make Halloween magic memorable!